Seica SpA participation at Electronica, Munich, November 13-16 2018 Hall A3 Booth A3-459, New Munich Trade Fair. Seica and innovation is a combination that customers worldwide have come to expect. This year at Electronica Seica will be showing the power and performance of the new VIVA Next hardware and software platform in a totally innovative setting: a virtual factory, where visitors will be able to explore, hands-on, inside and out, Seica’s Pilot V8 flying probe tester, as well as view the fully automated Compact SL for in-circuit and functional test and the Firefly Next, Seica’s cutting-edge, laser-based selective soldering system. 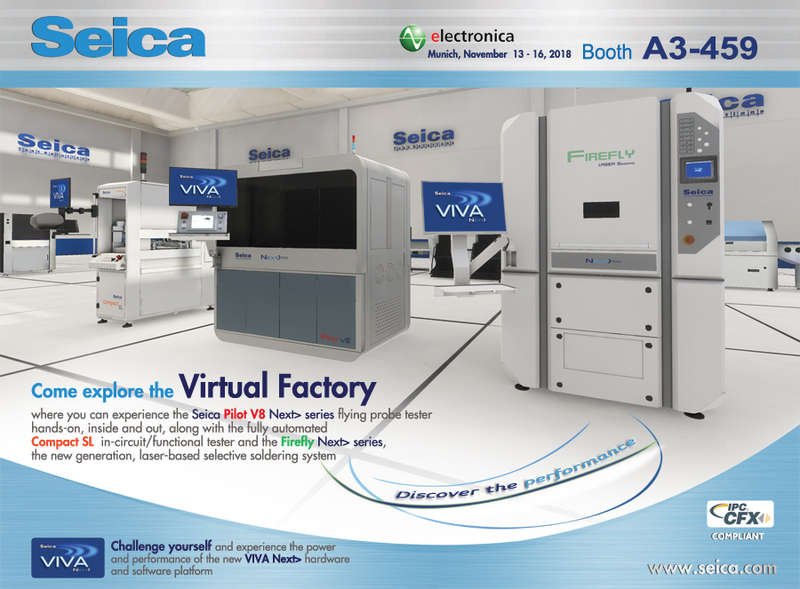 In addition, several Seica Mini line test and programming stations will be on display in the Technology area of the booth, where visitors will be able to see the power of VIVA Next software and experience how easy it is to create functional tests using the Seica’s graphical Quicktest environment or simply using MS Excel.